Batting: AN Cook 70 off 221 148 balls, Johnny Bairstow 27 off 59 balls, Ben Stokes 38 off 81 balls. Bowling: Mohammad Abbas 4/23 in 14 overs, Hasan Ali 4/51 in 15.2 overs, Faheem Ashraf 1/28 in 9 overs, Mohammad Amir 1/41 in 14 overs. Bowling: Stuart Broad 1/10 in 7 overs, Mark Wood 0/9 in 6 overs. It was the Day 1 of the 1st test of Pakistan Vs England on one of the most prestigious cricket ground i.e. Lords. Both teams had their strengths and weaknesses as the teams hoped to overcome them and win the first test match of this series. So, the match started as the toss was held between both teams. England won it and chose to bat first on this pitch. Toss has always been an important factor in Pakistan Vs England matches, and now that Pakistan lost it, they knew that they would have to work hard to come out on top. So, the English openers came on to the field as the Pakistani skipper, Sarfraz placed his men on the field and gave the new ball to his pacers. So, the 1st innings went underway as Cook and Stoneman were welcomed by Pakistan’s superb pace attack. 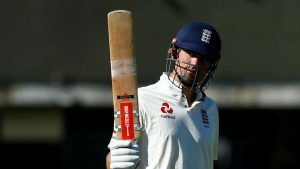 Cook looked solid, however, Stoneman couldn’t hold out with him as Mohammad Abbas shattered his stumps in the 4th over. 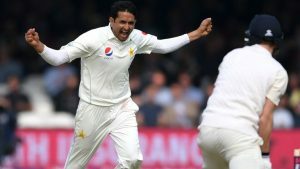 The English captain, Joe Root now came on to the crease but failed to take his score in the double digits as Hasan Ali got him out to claim his first wicket in the 14th over. Hasan’s blazing attack didn’t end here as he returned in the next over to take Malan’s wicket and England were now 3 down for 43 runs. Johnny Bairstow now joined the former English captain as both batsmen looked to build a solid partnership between them. And they succeeded in doing so as the pair added 57-runs to the scoreboard and Alastair Cook reached his 54th Test fifty in the process. The pair was going strong however, Bairstow’s attempt to attack the bowlers didn’t go well as he played a rash shot and gave his wicket to Faheem Ashraf in the 37th over. 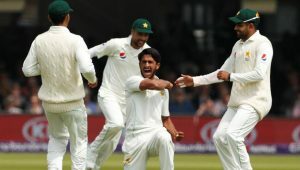 Cook was now joined by the ever-green all-rounder, Ben Stokes and another solid partnership of 49 was shared between the two before Amir took out Cook in the 48th over to deny the former English captain a century. Buttler joined Stokes, however after a brief partnership of 19-runs between the two Stokes fell in the 54th over, followed by Buttler who got out in the very next over. With these two wickets England’s lower order was exposed and Pakistan took advantage of it and ripped through the remaining English batsmen. The last wicket was taken by Hasan Ali as England were all out on 180 runs. It was now Pakistan’s turn to bat as their openers Azhar Ali and Imam-Ul-Haq got set on the crease. A partnership for the 1st wicket would put pressure on England but that did not happen as it was Broad who took the opening wicket of this innings to send Imam back to the pavilion in the 6th over. 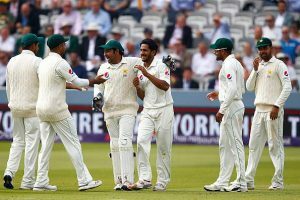 But, England were in for a surprise as after that Azhar Ali and the new batsman, Haris Sohail didn’t allow the English bowlers to get a breakthrough. And, so Pakistan ended their first innings on 50 runs for the loss of one wicket. End of 1st Test – Day 1 (Pakistan Vs England): That is it for today do join allsportspk tomorrow for the 2nd day of this riveting test between Pakistan Vs England. Next articleUEFA Champions League Final: Match Winner – Ronaldo Or Salah?